Heads on for more information about DiGi pre-order. As promised, DiGi starts its pre-order for Samsung Galaxy Note 3 today (18th September 2013). What a good timing, DiGi to coincide with iOS 7 release time. And it is indeed confirmed that the RRP (Recommended Retail Price) for Galaxy Gear by DiGi is RM999. 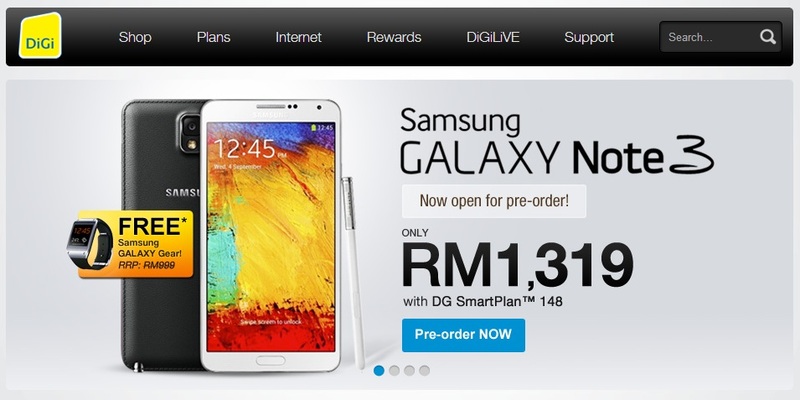 And if you pre-order your Galaxy Note 3 with DiGi and its DG SmartPlan RM148 for 2 years contract, you will get Galaxy Gear for free. This is a sweet deal from DiGi as Galaxy Gear is only compatible to Note 3 out of box. DiGi will start to deliver Galaxy Note 3 to its customers starting on 25th September 2013. Oh ya, one more thing. The Galaxy Note 3 offered by DiGi is LTE version and the RRP is RM2,399, not RM2,299 as what the rumours said. Click here to go to DiGi Galaxy Note 3 website. What’s your say? Note or Not? [RUMOUR] DiGi – Samsung Galaxy Gear Price in Malaysia is RM999? [RUMOR] Samsung Galaxy Note 3 Launching on 4th September 2013?! [RUMOR] No 6-Inch Samsung Galaxy Note III but 5.7-Inch? Next story BRINGING NINETOLOGY ONTO THE NEXT UPSCALE LEVEL!!! Previous story iOS 7 Worldwide Download & Release Time & Date!